In January 2016, Aéroports de Paris saw 6.8 million passengers; an increase of 0.9% on January 2015. 4.7 million passengers travelled through Paris-Charles de Gaulle (+0.4%) and 2.1 million through Paris-Orly (+2.0%). The number of connecting passengers increased by 4.1%. The connecting rate stood at 28.6%, up by 1.0 point compared to January 2015. Passenger traffic at TAV Airports, 38%-owned by Aéroports de Paris, increased by 2.9%(1) in January 2016, and has risen by 7.4%(1) over the last 12 months. Passenger traffic at Santiago de Chile, 45%-owned by Aéroports de Paris, rose by 7.6% in January 2016, and has risen by 7.5% over the last 12 months. (1) TAV Airports started to operate the domestic terminal at Milas Bodrum Airport in August 2014, and the international terminal in November 2015. To be compliant with TAV Airports' presentations, the % change presented above does not take into account the traffic figures for those Milas Bodrum terminals for 2014 and 2015, respectively. 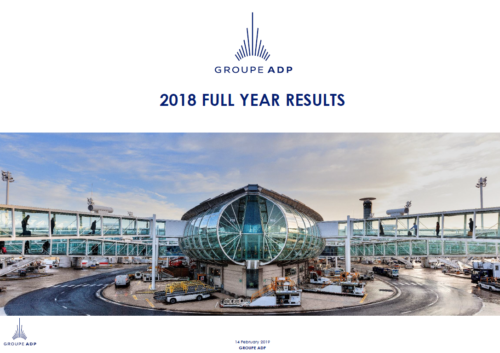 Taking into account traffic at those Milas Bodrum terminals on a like-for-like basis for 2014 and 2015, total TAV Airports passenger traffic would have risen by 2.9% in January 2016, and by 5.9% over the last 12 months. (1) TAV Airports has been operating the domestic terminal at Milas Bodrum Airport since August 2014, and the international terminal since November 2015. To be compliant with TAV Airports' presentations, the % change presented above does not take into account aircraft movements at those Milas Bodrum terminals for 2014 and 2015, respectively. Taking into account aircraft movements at Milas Bodrum on a like-for-like basis for 2014 and 2015, total TAV Airports aircraft movements would have risen by 3.6% in January 2016, and by 4.8% over the last 12 months.